During the 1940s, Film Noir emerged as a style in the American cinemas. The style was influenced by German Expressionism and was known for its dark aesthetics and themes. Film Noir utilized these elements to create a sense of dark pessimism, fear, mistrust and general insecurity that was rampant at that time. In a sense, Film Noir is a harsh depiction of American culture, a culture which was changed by the horrors of World War II. Most Noir films star a morally ambiguous characters that battled corruption and crime a fictional urban landscape which has been neglected and plagued by violence and crime. The setting is a reflection of society’s post-war attributes, symbolizing a damaged world which has become morally anarchistic. Neo-noir is a style often seen in modern films that prominently use elements of Film Noir, but with updated themes, style, techniques or visual elements. Neo-noir introduced innovations that were not available with the earlier Noir films. The violence was also more potent than in earlier Noir films. The film Se7en is one such example of a Neo-noir film. Directed by David Fincher in 1995, the plot revolves around David Mills, a young detective who is partnered with the retiring detective, William Somerset; who are both tasked with tracking down a serial killer who uses the seven deadly sins as tropes in his murders. Somerset is the world-weary male protagonist that is definitive of Film Noir. Like so many of Film Noir’s battered cops, Somerset has amassed a lifetime of dealing with filth and amoral misfortunes. He has nothing more than his profession to define him– upon being asked, the closest he came to normality was almost getting married once. In one scene, the deafening silence of his personal life is filled by the ticking of a bedside metronome. And of course, iconic of the Film Noirs, the detectives in Se7en are often seen dressed in their fedora hat, trench coat and suits. Fincher cleverly used the elements of Film Noir/Neo-Noir (low-key lighting, contrasting shadows, dark plot) to emphasize on the film’s theme of moral decay throughout Se7en. The film’s theme of the decay of morality is most prominent in the murderer’s (John Doe) motivations. “We see a deadly sin on every street corner, in every home and we tolerate it,” he says. “We tolerate it because it’s common, it’s trivial. … Well, not anymore. I’m setting the example”. He hates to see the world having deteriorated into sin and immorality to the point that he has gone insane and decides to take things into his own hands. Characteristic to Film Noir films, the movie is set in a bleak, crime-infested, dirty urban unnamed city that is portrayed through the use of chiaroscuro lighting, silhouettes, and contrasting shadows. It reflects the moral decay of the people in it, and a sense of despair and desolation. Also, the idea of a nameless city is scary because it is similar to a nightmare, crime happening everywhere, garbage floods the streets, low moral, and we are being shown how we are the same way. Commonly found in Film Noirs, the use of low-key lighting runs throughout the entirety of the film. For example, there are numerous scenes in buildings and apartments with boarded up windows, no lighting in the rooms but from a torchlight held by the detectives or a crack of light through a window, making a contrasted image. The contrasting imagery in the film highlights the dark and conflicting aspects that exists in every one of us. The use of low lighting in these scenes is to create tension and a sense of unease, which provides a brilliant base for the plot as the dark story line unfolds. Chiaroscuro lighting is also often used in conjunction with obstructions such as bars or rails that help to frame the characters morality and foreshadow their fates. The setting in the film is also often also obscured by rain, a common aspect of Film Noir often used to emphasize the characters conflicted emotions, and create an atmosphere of hopelessness in which each day blends indistinguishably into another. The rain also serves to heightening the suspense and drama of a sequence, particularly in the climactic chase scene where John Doe presses a gun to Mill’s temple, the rain dripping forebodingly off it. The rain is also used to create reflections, a stylistic element of early Noir, in which the image of a character, in this case John Doe, is distorted, portraying an ominous presence and making audiences unsure and wary of what or whom they are seeing. Fincher has truly did an outstanding job in bringing across the message and theme of Se7en through the usage of several Film Noir stylistic elements; showing us a meditation on the frightening pervasiveness of evil. A bleak vision of the world we live in. Interesting subject and example to back up topic discussed. I am glad that you pick this angle to elaborate on our film noir topic. I am just wondering if you think the rest of David Fincher’s films are similar to se7en? 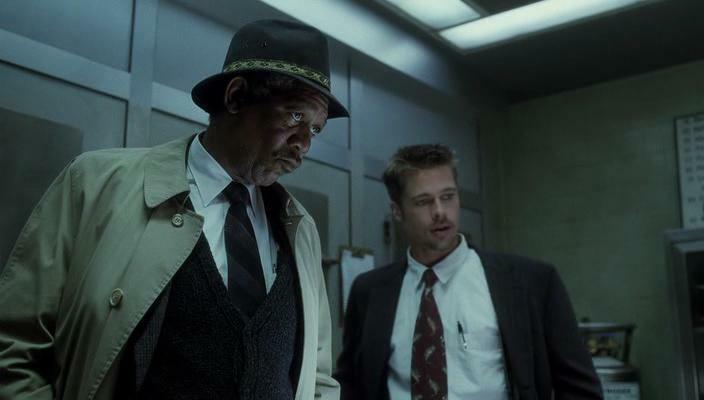 Is se7en your typical neo-noir?